In short, Roxie Hart is a very funny comedy. It pokes fun at “journalism”, and the public that laps up their lies/exaggerations like cats with milk. It pokes fun at the legal system. And it pokes fun at entertainerss, and how they’ll use anything for publicity. Even murder. It sounds like a dark comedy, but it really isn’t. It’s very enjoyable, and borders on becoming a musical. One of the funniest, most outrageous scenes is with Roxie dancing on top of a table. In the jail. With the newspapermen and women joining in. There’s a reason that this was remade as the musical Chicago. Roxie Hart is both fun and funny, and highly recommended. I rate it four stars – enjoy! 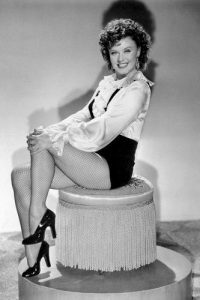 Roxie Hart (Ginger Rogers, The Major and the Minor). Roxie is the dancer at the center of a murder case. Who is willing to plead guilty to a murder charge to advance her career. And the madness begins … Ginger Rogers had an absolute gift for comedy, and it’s on full display here. Amos Hart (George Chandler, The High and Mighty). Roxie’s husband, who initially admits to the murder. But he recants when he realizes that Roxie was trying to start a dancing career. And, for comedy, the press ignores him repeatedly. Homer Howard (George Montgomery, Samar). The naive, honest newspaperman, who begins falling in love with Roxie. As time goes on, he becomes more of a central character. And he narrates the entire film in flashback. Jake Callahan (Lynne Overman, Union Pacific). The unscrupulous “journalist” who encourages Roxie to plead guilty to the murder. Not knowing, or caring, if she’s guilty or not. All he cares about are the papers that the story will sell. E. Clay Benham (Nigel Bruce, Terror By Night). The dead man’s partner, who takes the opportunity to sign Roxie to a contract. Also not caring about her guilt or innocence, only what he can gain from the publicity. Babe (Phil Silvers, A Funny Thing Happened on the Way to the Forum). A minor but funny appearance as the newspaper photographer. O’Malley (William Frawley, I Love Lucy). The bartender at the beginning of the film, who also becomes important in the flashback. No spoilers!